When it comes to acquiring resources like talent and technology, CFOs usually have three thoughts: this is a “must have no matter the cost,” a “would like to have, but cost matters,” or an “only have if there is money left over.” Data analytics and Big Data projects are quickly moving up from the bottom of that list. It is no longer a “we will talk more about it later” item. It has become a “must have.” Yesterday. As a CFO, you are constantly inundated with reports and data provided by your different managers in the organization – from accounts-receivable details, to budget and expense analysis, to customer reports. People are constantly talking about more structured and unstructured data being available and that CFOs should be reviewing that information as well. Reviewing and analyzing that data is a full-time job, in addition to the other hats you wear. It can be overwhelming, and any CFO can get lost in the details. In order to come up with a solution to the problem, an understanding of Big Data is crucial. Big Data can be simply defined as the digital trace we provide from all activity – from journal entries recorded to sales journals to information gleaned from customers and employees. More people are becoming aware of the velocity and volume that data is being captured. Information is doubling by about every 12 months at this point. Beginning to analyze this data can help an organization learn its customer’s habits and employee’s patterns, as well as know what industry trends to maintain. Knowing that a customer bought 12 widgets is informational. It is not helpful. But knowing a customer bought 12 items last month and six this month and has repeated that pattern for the last two years might provide insight you can use to better sell to that customer. Likewise, knowing that a customer’s payment on credit has increased from an average of 12 days early in the year to more than 45 days at the end of the year can help you understand their struggles and alert you to move more resources to collecting that cash. In one example of data analysis, a small manufacturing company had an accounting system that showed credit limit and outstanding accounts receivable but no report for showing the customers who had exceeded their credit limit. A simple data extraction and analysis showed the six customers over their credit limits, and the company went after that cash first. Data analysis can also play an important role in strengthening an organization’s internal controls. Following the patterns in employees’ vacations or uncovering an attempt to circumvent established preventive controls are examples of using data analysis to improve the controls of policies and procedures. An analysis of the vacation patterns of employees to transactions that occur within the financial system is one way to locate fraud being committed by employees with too much control over procedures or employees who never take a vacation. (The assumption may be that such employees stay in the office to keep their fraudulent actions from being detected.) Cross-training employees, when applicable, and rotating duties allow extra precautions to employees who are constantly covering their tracks. Periodically reviewing the vacation, or lack thereof, of all employees allows for trends to stand out. 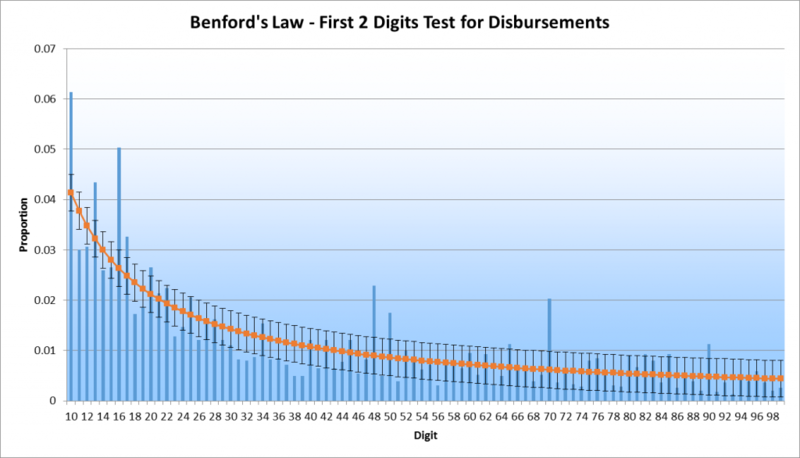 Reviewing an organization’s disbursement listing using an exploratory technique, such as the use of Benford’s Law, can uncover employees who are circumventing controls such as dual signatures on invoices. Such use of Benford’s Law involves reviewing the numbers within a dataset and finding anomalies outside those numbers that occur naturally (without outside manipulation applied). The graph below shows a listing of disbursements by employees who were circumventing the dual-approval control set at $5,000 by issuing checks to vendors at $4,800 and then the remainder of the invoice at a lower dollar amount. The orange line shows where the amounts should have fallen – and the blue lines show where they actually did fall. All the spikes above the blue line are anomalies that would require further investigation. Comparing your business’s activity to the trends in industry has been a data analysis technique employed before we knew the term “Big Data.” How am I doing compared to the industry, or, better yet, my competitors? With the Internet of Things allowing broad access to data, companies that are not diving into readily available information about the competition and the industry are falling behind. (Just reading through the items listed under “free datasets” in a Google search can be a full-time job.) Being able to overlay your own company’s information on that of other companies can provide a new perspective on how you compare and where you can make small changes to increase productivity – therefore increasing profits. For example, executives wanted their company’s manufacturing plant workers to know where they stood compared to the competition at all times. The hope was that this information would motivate the workers to understand issues in a way that would motivate them to collaborate on fixing the problems in front of them. To ensure full cooperation and buy-in from all employees, the executives decided to provide big TV screens broadcasting data at the entrance to the facility. In that way workers could see how each assembly line was performing in order for them to be able to tell where lines were down or supply was low. That would enable them to counteract issues and increase production to keep up with the company’s competitors. The sales by region of the company’s main competitors were displayed as well for extra motivation. By using live, cutting-edge data analysis processes, the manufacturer was able to empower its employees to help with the solutions to the issues facing the company’s daily production. In order to understand the habits, patterns, or trends, small organizations can benefit from employing a data analyst or data-minded individual whose sole job is to review all the data available to the company on a regular basis. Experienced data analysts know how to use analysis software to interpret anomalies and have experience in detecting the unexpected questions or answers the data presents. Once the problem has been made clear and the solution determined, acting on the issue and implementing change is the responsibility of all members of the organization, not just the CFO. All organizations spend money on storing and capturing data. Using that data to change the future of the business and industry is critical. Indeed, it’s becoming a “must have” for the CFO in the current business environment. Paul M. Perry is a member of the data analysis group in the consulting division of Warren Averett, an accounting, audit, and consulting firm.